Squirrel Cove is located on Cortes Island in Desolation Sound, B.C. There is a small dock and store on the shore, but the anchorage is located beyond. We can use our dinghy to get to the store. 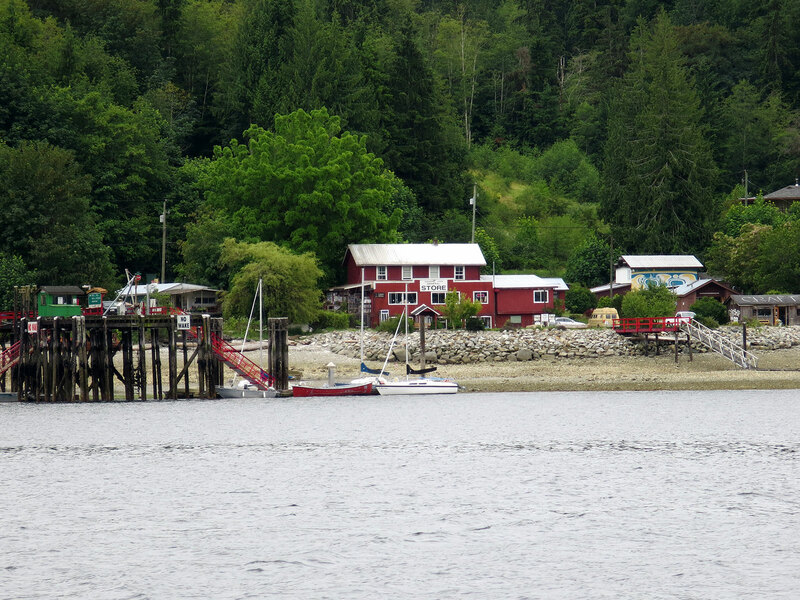 When we passed the Squirrel Cove store on our way to the anchorage, it was low tide. It was one of the lowest tides of the year. Last night when we ran the generator in Pender Harbour, we noticed that the battery monitor indicated we had lost more charge during the afternoon than normal. Also the charging usually starts out in a bulk mode when the batteries are discharged, and this didn’t happen when our charging started. So, now what? Is our battery monitor failing? Or is there a problem with our batteries? We know that two of our six 6-volt deep-cycle marine batteries have been starting to fail—not charging properly and not holding a charge. Replacing the batteries is on our list, but we didn’t do it before we left. We wanted to leave Pender Harbour early to take advantage of lighter wind in the morning, and hopefully get far enough north in Malaspina Strait before the wind built, so we decided to go on and wait to test the electrical situation after we got settled later today. 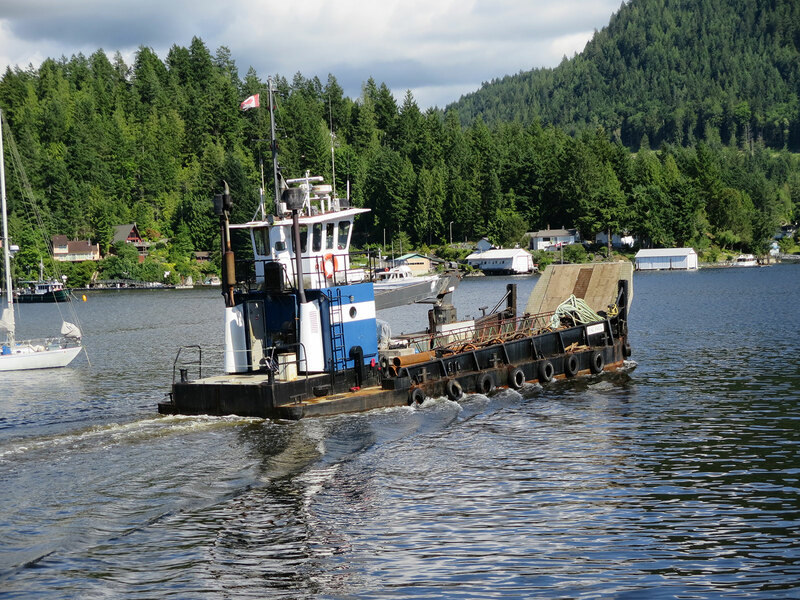 While we were anchored in Pender Harbour, a landing craft motored in and went to one of the marina docks. 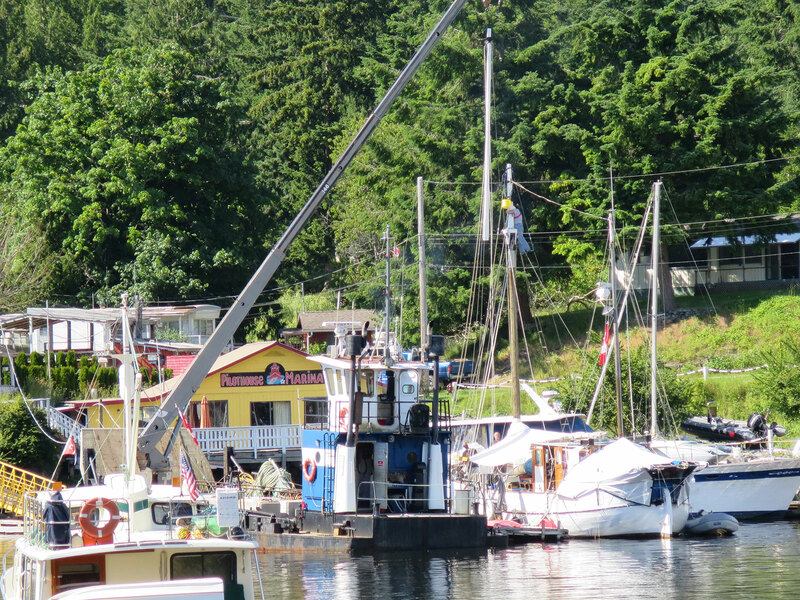 We watched the landing craft operator extend his boom and put the top on the mast of a large sailboat moored at the marina. When the mast was assembled, the landing craft made its way out of the harbor. The weather forecast was the same as yesterday…southeast wind 10-15. But we were heading north and would be going with any swell and waves in a southeasterly. Should be better. It was cloudy and a very gray day. We got underway at 0600, and it was calm in Pender Harbour. The predicted southeast wind materialized soon after we entered Malaspina Strait, but it was comfortable and easy on the crew. 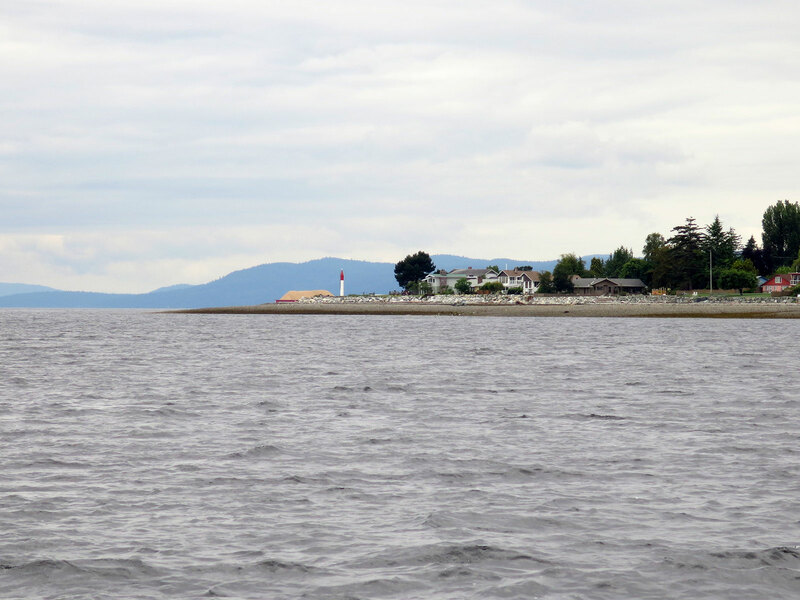 Approaching Grief Point on Malaspina Strait. This piece of land sticks way out into the strait and can cause turbulence if south winds kick up and waves stack up here. On our way to Desolation Sound, this view of Malaspina Strait is looking back toward Pender Harbour on the left and Texada Island on the right. 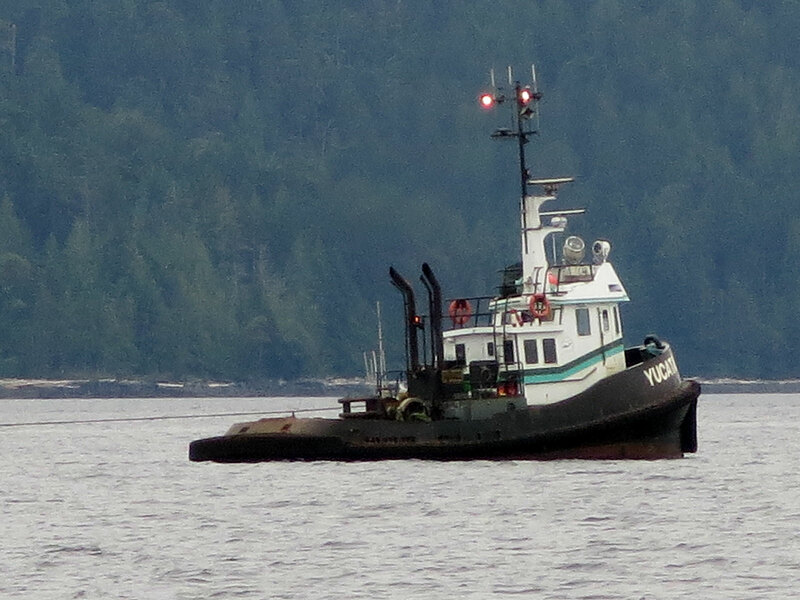 We passed this tugboat pulling a log boom in Malaspina Strait on our way to Desolation Sound. 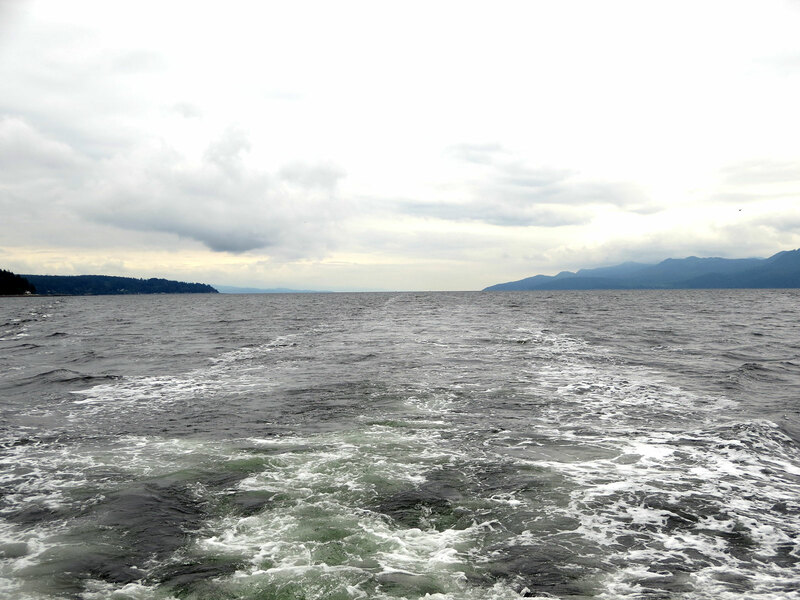 We had an uneventful cruise to Desolation Sound, which was nice. It stayed gray all day, but wasn’t cold. The wind was as predicted—10-15 knots from the southeast, but having the wind behind us made all the difference. We arrived in Squirrel Cove, our choice of anchorage for the night, about noon and got settled among a few boats already in the anchorage. 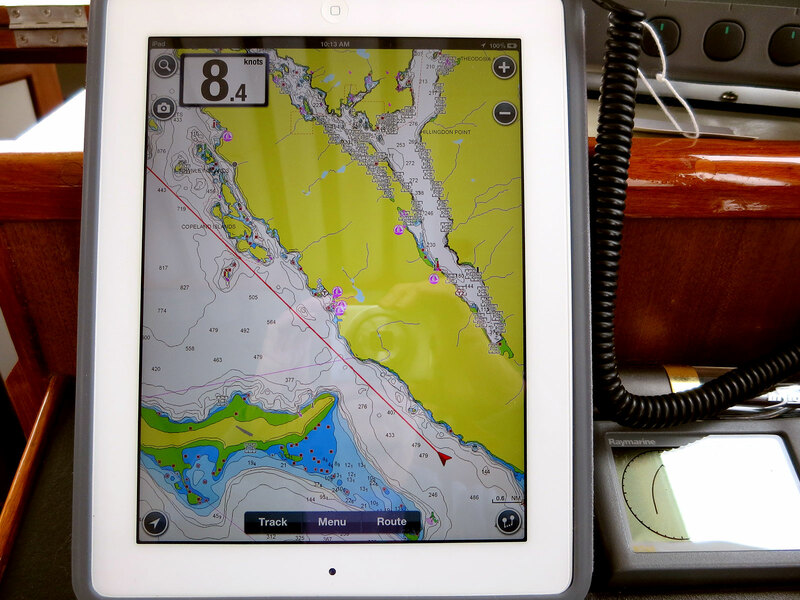 We’re still very happy with using our iPad for navigation. We have a great place in front of our chart plotter where we can put the iPad. A WiFi signal is NOT required, but it does use a lot of battery, so plugging it in to a charger is essential. There are several apps, but we’ve been happy with the one we use: Marine & Lakes: U.S. & Canada HD. I used our aging bananas to bake banana bread while Jim tackled his investigation of the electrical system. Turns out that the two aging batteries are in fact dead, and possibly are affecting the battery monitor. We think the other four batteries are okay, but they aren’t charging properly. Ahh, boats…there is always something! We think we can make our system last until we get back to Anacortes where it will be more convenient to replace the batteries, but we may choose to hang out more in marinas than on the anchor! And, of course, we will conserve our electrical usage. 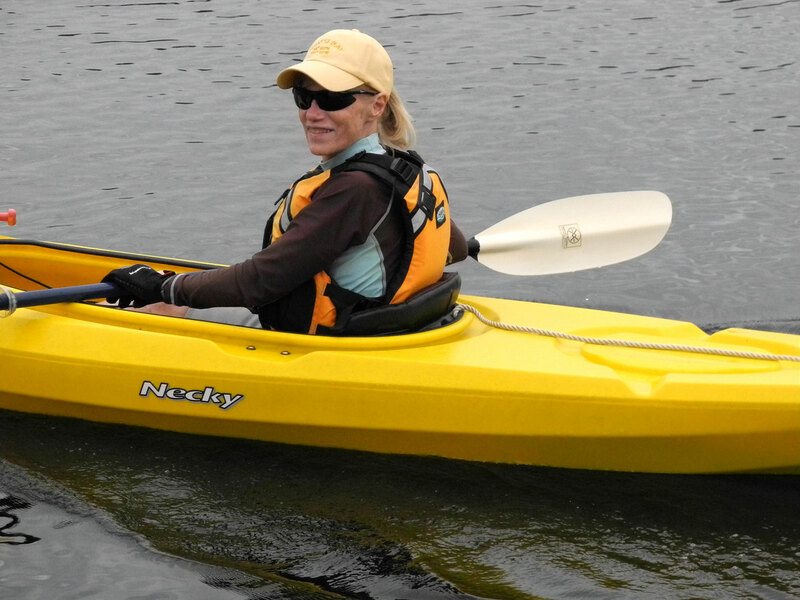 Alice kayaked all around the anchorage area in Squirrel Cove, Desolation Sound, B.C. We launched the kayak and I had a chance to have a nice paddle all around the Squirrel Cove anchorage. It was nice and calm and felt great to get out in the kayak. I paddled by the former “bread house,” which is now just a pile of boards falling apart on the beach. For many years, an accomplished baker offered fresh-baked bread, cinnamon rolls, and other goodies to visiting boaters in the summer cruising season. He’s been gone for quite a while, but I found it especially sad to see the remains of his cabin just deteriorating on the beach. 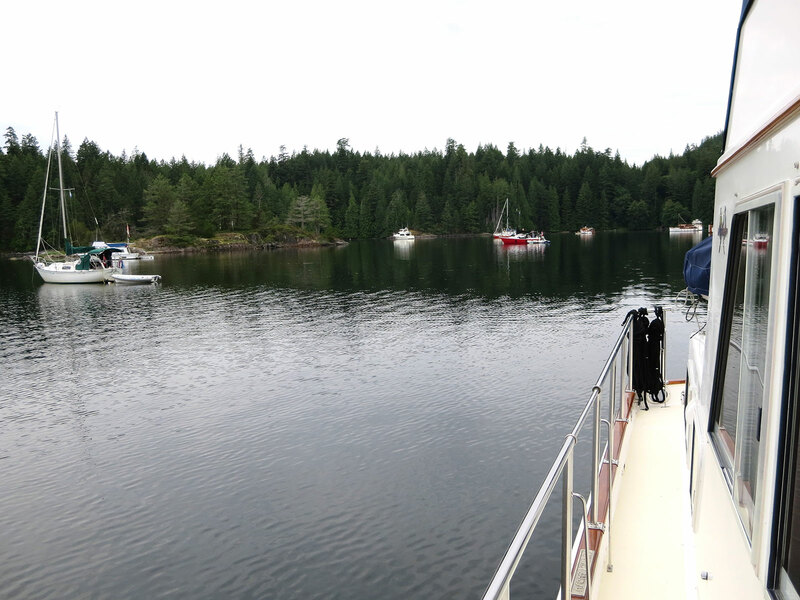 There were only a few boats anchored in the anchorage at Squirrel Cove, Cortes Island when we arrived. We’ve enjoyed anchoring at Squirrel Cove for years. 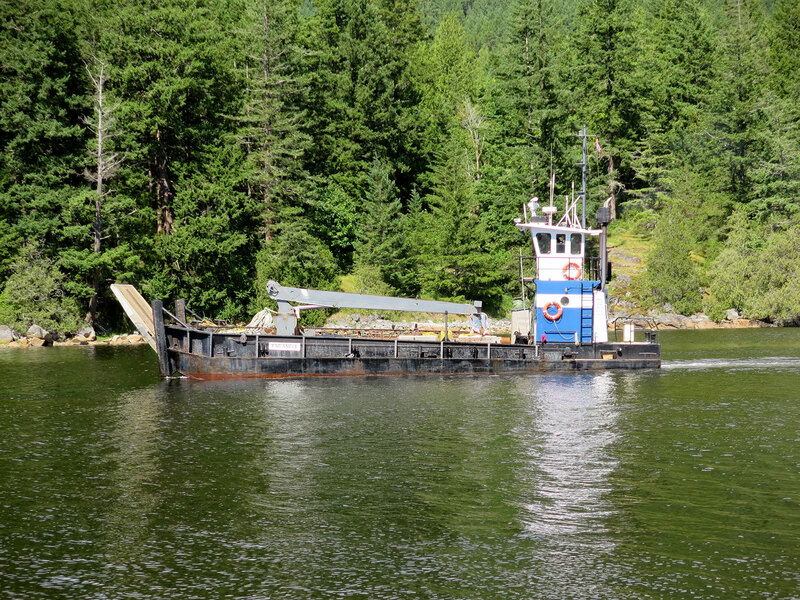 It’s easy to access and is on a direct path through Desolation Sound. It’s big enough to accommodate many boats, so we can usually find a place to anchor there regardless of what time we arrive. We are now reading about plans to put a marina in the anchorage area that will alter the navigation and access to the cove! This would also significantly reduce the available space for anchoring. We understand that in 2011, the Klahoose Resort Limited Partnership has applied for a large water lease in the anchorage area to build a marina and resort. They are holding meetings this summer to discuss this proposal. There is a movement underway to save the anchorage, although it’s hard to say if that will help. More information is available at this website. It would be sad to see Squirrel Cove commercialized. The wind died down in the evening, and we had a very peaceful night…even though the clouds hung in there and the forecast calls for continued unsettled weather. Note: We’re cruising in areas where our anchorages don’t always provide access to the Internet. We’ve had good WiFi access at our current location and have been able to get caught up with some of our posts, but we’re still running a little behind. We’ll continue to publish posts when we have a good WiFi signal. We’ll get up to date eventually! This entry was posted in Cruising, Maintenance, Projects, Travel and tagged 6-volt deep cycle marine batteries, battery monitor, Cortes Island, Desolation Sound, iPad navigation, kayaking, Malaspina Strait, Pender Harbour, Squirrel Cove, Texada Island by Sailor Lady. Bookmark the permalink. Good to hear things are not all bad. FYI, still raining in Bend. .23 inch in last two days, not much by west side or coastal standards but wet by Central Oregon standards. Bobbe and I are starting to get out and went tent camping in the Ochoco NF. It was great until the rain started Saturday night. Now I am drying out the tent and gear. Still raining here too. Hopefully summer will get here one of these days. I think there’s hope…it’s almost the Fourth of July! Sure a wonderful place, and love the little yellow kayak. It least when you have equipment failures, you are already on “land”. Hope it all gets resolved. Keep us all up to date.